Putnam County New York. Schenectady County New York. A highly appealing 1912 large format folio map of Putnam County and Schenectady County, New York, issued for the New Century Atlas of Counties of the State of New York. Essentially two maps on a single sheet. The upper map covers Putnam County the east side of the Hudson River from Highland Station to Storm King, including Cold Spring, Dennytown, Brewster, Haviland Hollow, Kent Cliffs, and Tompkins Corner, among others. 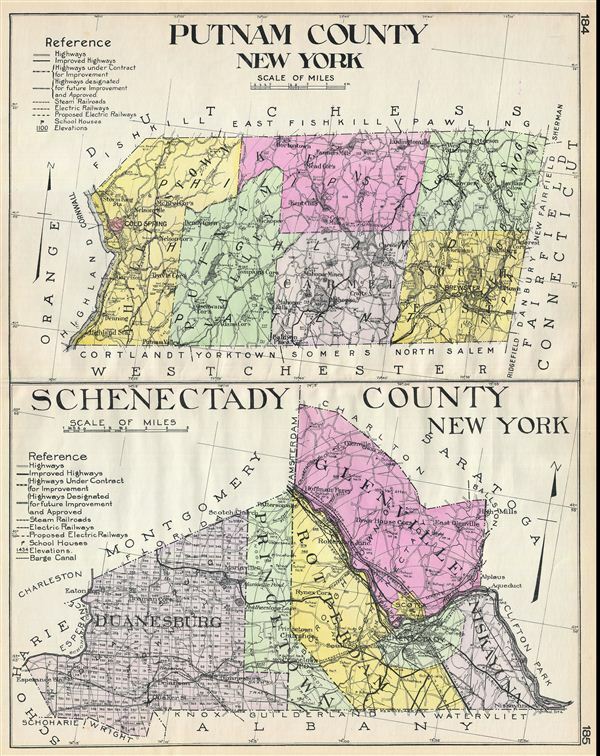 The lower map covers Schenectady County, including Duanesburg, Princetown, Rotterdam, Glenville, Niskayuna, and of course Schenectady. There is appealing detail throughout with the roads, towns, and railroad lines clearly represented. Various communities are identified with larger districts highlighted in vivid pastels. Issued as plate nos. 184-85 in Everts' New Century Atlas of Counties of the State of New York.